Best friends tell each other the truth – don't they? When North Stone's best friend Kelly Orton is found hanging lifeless in a tree, North knows for certain it wasn't suicide. Kelly had everything to live for – a loving boyfriend, a happy life, and most importantly of all, Kelly would never leave North all by herself. 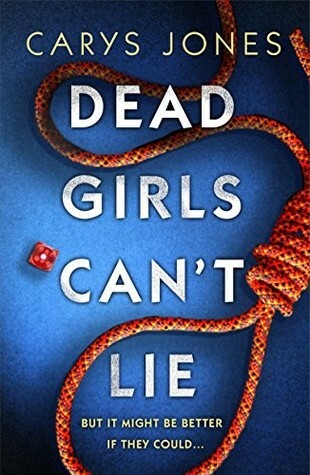 DEAD GIRLS CAN'T LIE is a different type of mystery. It starts off rather slowly and more then once, I considered setting it aside. I am really glad that I didn't however because North grows on you. North has had issues in the past when her parents disappeared. Heck she still has issues but has managed to pull everything together until Kelly hung herself. She just knows that there is NO way that Kelly would have been out jogging and decide to kill herself. The police won't listen to her so North decides to do her own investigation. I ended up really enjoying DEAD GIRLS CAN'T LIE once I started to relate to North. She is a good example of what one person can accomplish without the assistance of authorities or even Kelly's boyfriend. I think that my readers who enjoy British mysteries would like this book. Just be prepared for a slow beginning.